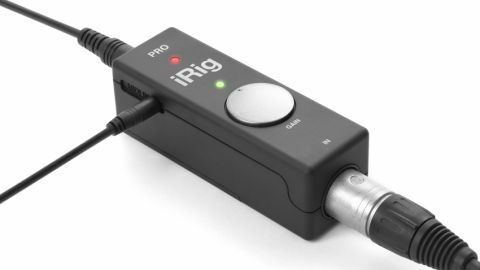 It might be on the pricey side, but the iRig Pro could meet all your iOS interfacing requirements at a stroke. Neat and compact. Does audio and MIDI simultaneously. Decent software bundle. No audio output. Not the cheapest. The latest addition to IK Multimedia's swollen range of iRig mobile audio interfaces is a pretty elegant affair that gives your device both audio and MIDI input capability. The iRig Pro is pretty solidly built, has a satisfying rubbery finish, and boasts a dual XLR and 1/4-inch jack connector that works with both line-level and instrument inputs. A phantom power mode means that you can use a condenser mic with the device, though this requires an (included) 9v battery. The package also includes a MIDI to 1/8-inch mini-jack cable for hooking it up to your DAW or controller's MIDI Out port, plus Lightning, 30-pin and USB cables for connecting it to old and new iOS devices or a Mac. Aside from the phantom power switch, the only control on the interface is a gain knob, which is accompanied by a handy level indicator LED. The unit doesn't require any kind of setup - you simply plug and play, and we found that the iRig Pro worked flawlessly with third-party synths and recording software. It also works with a selection of IK Multimedia's free apps, including AmpliTube Free, SampleTank Free, iGrand Piano Free, VocaLive and iRig Recorder, all of which (aside for iRig Recorder) have dedicated iPad versions. Most of the apps have extra features that can be enabled by registering the hardware, and you also get T-RackS CS Classic, SampleTank XT and AmpliTube Metal for Mac - not a bad selection. The only major issue we had with the unit was that it doesn't include any kind of audio out, which is a pity. If it had it would have made for a compelling all-round package. However, thanks to its decent sound, sensible form factor and wealth of included software, the iRig Pro still represents decent value for money.